What’s one food that you eat almost daily? For me, it’s eggs and potatoes. I usually have an egg whisked into my oatmeal at breakfast and sometimes have eggs as a protein source at lunch. 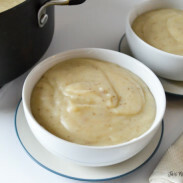 Potatoes – both white and sweet – are a staple for lunches and dinners. Eggs provide a powerful punch of protein, healthy fats, and B vitamins, while both types of potatoes provide complex carbohydrates, potassium, and other nutrients. Essentially, the combination creates the perfect meal to nourish the body throughout a hard training cycle or after a hard workout. 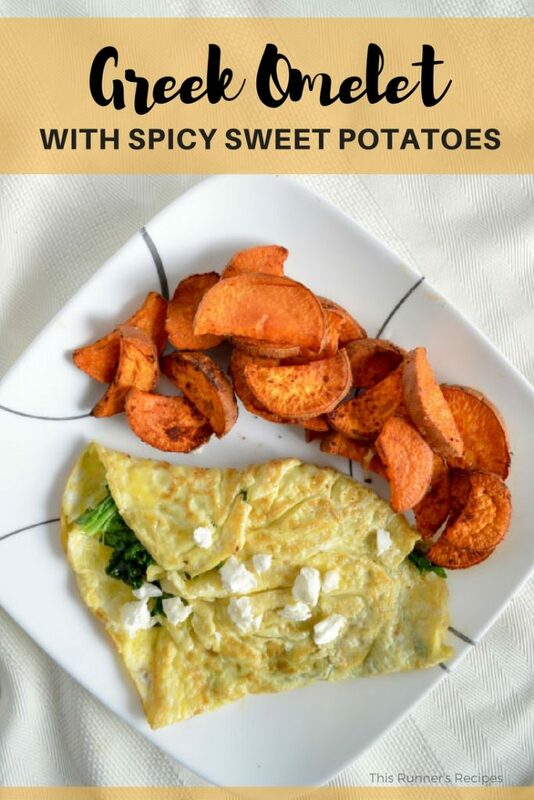 This Greek omelet with spicy sweet potatoes is one of those meals that leaves you feeling better after eating it. 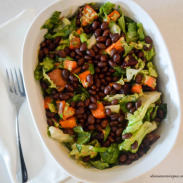 The complex carbohydrates and protein are energizing, while the flavors perk up the palate. Spicy paprika complements the earthy flavor of the sweet potatoes and tangy feta balances the slightly bitter flavor of the kale. I certainly believe in eating everything and letting yourself have your favorite treats in moderation; however, I also firmly believe that overall diet quality impacts training race performance. It’s all about balancing those nutritious meals with treats in moderation. You can’t run your best race off of a diet that primarily consists of potato chips and processed meat. The common excuse is that there’s not enough time to eat healthy foods. It takes time to grocery shop, chop, and cook – but it doesn’t take as much time if you are deliberate and smart in your meal choices. The small investment of time pays huge dividends in both athletic performance and overall health. If you’ve read this little corner of the internet before, you might know that I am a firm believer that healthy eating doesn’t need to be complicated. Nor should it be time-consuming – especially if you are training hard for a race on top of work, family, and life, the last thing you want to do is to labor over the stove for hours each night. The balance of eating nutritious meals and minimizing cooking time isn’t as difficult to achieve as it seems. This simple yet satisfying meal comes together in less than 40 minutes – and a majority of that time is hands-off. The spicy sweet potatoes are roasted and the omelet takes a matter of minutes to whip up – in less time than your average length run, you’ll have a warm and nutritious meal. You can prep the sweet potatoes at the start of the week in a large batch, which would reduce the overall prep time to less than 10 minutes. Wash the sweet potato and slice it into thin, equal sized slices. 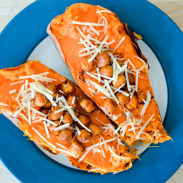 Toss the sweet potato slices in a bowl with 1 teaspoon olive oil, smoked paprika, and salt to taste. Spread in a single layer on a parchment paper lined baking sheet and cook for 30-35 minutes, flipping halfway through for even cooking. Near the end of the cooking time, heat 1 teaspoon of olive oil in a flat skillet over medium high heat. Whisk together the eggs, remaining teaspoon of olive oil, and salt. Wash and massage the kale, then squeeze out any excess liquid. Pour the eggs onto the skillet in a thin layer and then reduce the heat to medium low. Cook until the eggs begin to set, and then add the kale and feta in the middle of the eggs. Carefully fold the outer edges of the eggs over the kale and cook until golden brown. 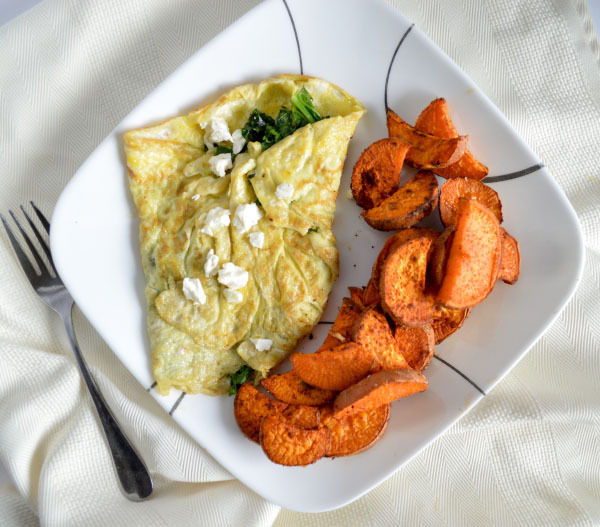 Top the omelet with additional feta if desired and serve with the roasted sweet potatoes. Recipe can be easily increased - simply multiple by the number of people you hope to serve. What’s your go-to meal on busy days? What foods do you eat almost daily? I eat lots of eggs and potatoes too. Ive actually cut back on the eggs since I have gotten back into the habit of making smoothies for breakfast. I love sweet potatoes as a side dish- we have them at least once a week. It’s amazing how many eggs we can go through in a week. Roasted sweet potatoes are such a good side dish! my go-to foods for every day lately have been changing! Except for oatmeal, nothing is too standard for me anymore which is so weird but maybe needed. I do love sweet potatoes again though and I haven’t done paprika on them in a while! thanks for the reminder. Oatmeal will forever and always be a staple. I think I’ve been eating it for breakfast since high school! Paprika brings out the flavor of sweet potatoes so well, especially in savory dishes. I’ve been eating more and more eggs lately. I’m actually making the kids a spinach, mushroom and feta omelette for brunch today! They have today and tomorrow off of school (these kids get so many days off these days!). Callum LOVES eggs. So when I make him an egg, I usually whip some up for myself too. YUM that omelette sounds good! I love feta cheese. Yum!!! That looks like my weekend breakfast 😀 I love eggs but don’t have as much time for them during the week so I go crazy with them on the weekends! Eggs make such a nice leisurely weekend breakfast! I want that salad you posted on Instagram. Can we be food twins with that? My go to breakfast is an english muffin with PB + fruit (apple, banana, grapes). Baseball season in our house has caused me to slip out of some of my normal planning and prep work….and I can feel the difference in my mind, body and outlook on life. Thank you for sharing this yummy sounding recipe!! Thank you! Prepping does go through ebbs and flows of life – some weeks I am WAY more on top of it than others. But roasting veggies can be done in such big batches that now when I make dinner, I just roast up extra for the next day – no extra work!